What is better than a glass of margarita? 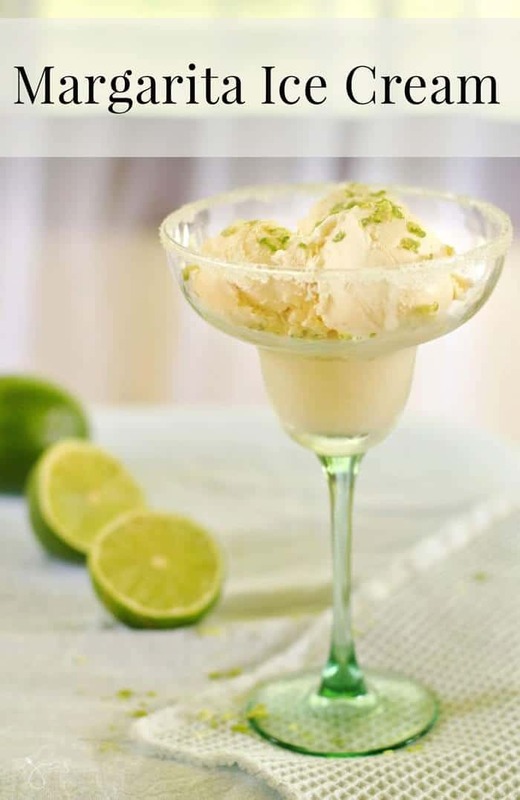 A glass of margarita ice cream, of course! Enjoy your favorite cocktail without getting a buzz. Refreshing and delicious, this homemade ice cream is the perfect treat for adults after a long workday. 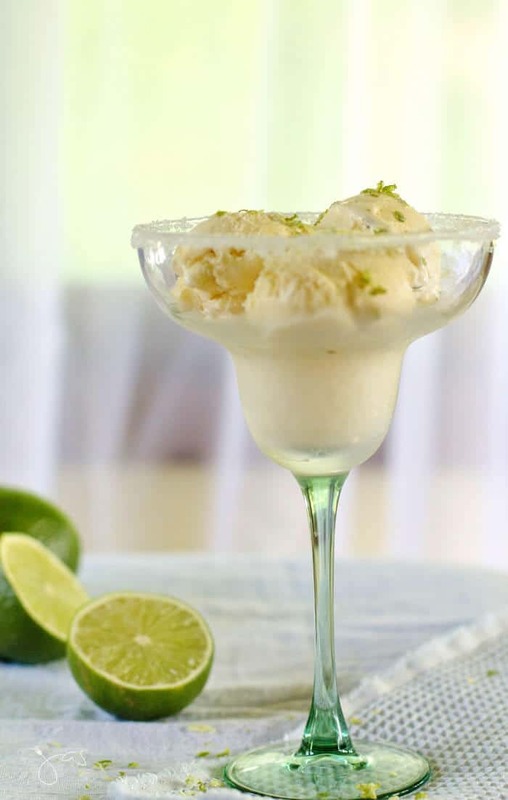 With a glass of this margarita ice cream, every hour is a happy hour! Best of all, it’s super easy to make – no ice cream maker needed. On hot summer nights, I like to sip on my dinner. I sit in my backyard with a cold glass of dinner in one hand and my camera in another and observe dozens of butterflies, birds, and squirrels chased by our dogs. This summer just took a whole new level when I discovered Margarita Ice Cream. Oh summer, I love you so! 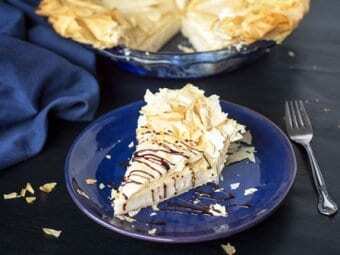 What better dessert to accompany those nights than this one? Ok, maybe rum and raisin ice cream is a good substitute. Anything with booze, really. Did you know you can make frozen yogurt with wine and Greek yogurt? That one is going on my to-try list for sure. Homemade ice cream is so easy to make and this one was way too easy to eat. This express dessert-delirious should not be served to underage children. More for us, right? Serve this melt-in-your-mouth margarita to your Cinco de Mayo party guests for dessert. A great finish to a great event! 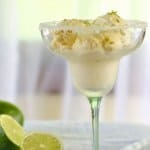 Put the milk, cream, lime juice, triple sec, and tequila into a large bowl and whisk until soft peaks form. It should be thick and smooth but not too stiff. Scrape into an airtight container to freeze overnight. Because of alcohol, it will not freeze too hard and it will melt quickly. Serve in margarita glasses with sugar/salt dipped rims. Garnish with lime zest. Cheers! 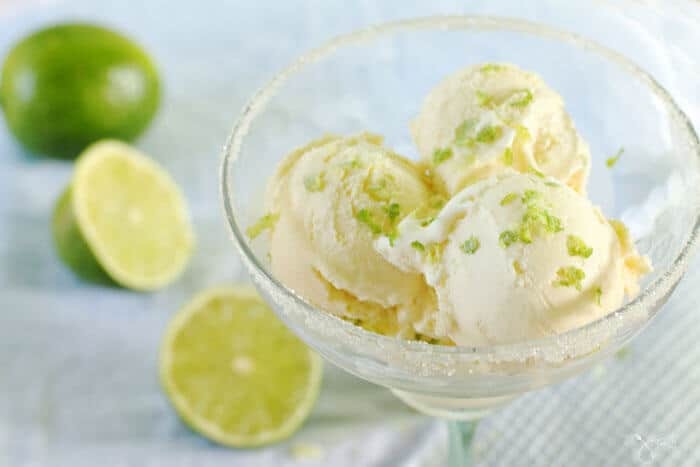 No-churn margarita ice cream is a refreshing grown-up treat perfect for summer parties or after a long workday. Make every hour a happy hour with this grown-up treat! Serve in margarita glasses with sugar/salt dipped rims. Garnish with lime zest. 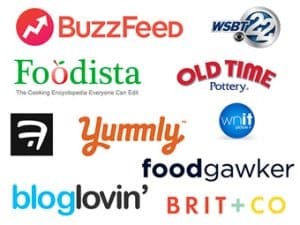 Featured on: Fluster Buster, The Pin Junkie, Across the Boulevard, Refresh Restyle, Farmhouse 40, The Lazy Gastronome, City of Creative Dreams, and Dizzy Busy and Hungry. 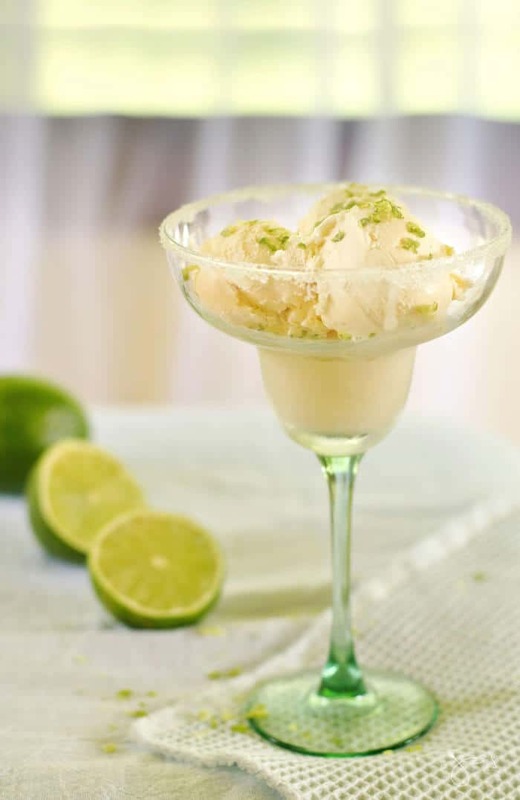 I LOVE that you made margarita ice cream, it’s like my two favourite things combined. I’m definitely going to make this soon! Oh my goodness this is amazing. We used to get milkshakes from McDonald’s and put Malibu in them back in the day. Not the same, but I bet this would be amazing!!! This looks AMAZING! I can not, can not, CAN NOT wait to make this! And then I can’t wait to make it a 2nd time.. This looks delicious Jas and perfect for summer! Thanks for sharing at #BloggingGrandmothersLinkParty and have a great week! Oh my…I’m going to have to try this! It looks like it could become addicting. 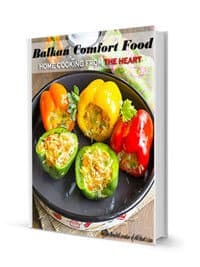 I love simple recipes and this fits the bill for sure! It is, Angie! Although it doesn’t give you a buzz unless you eat it all by yourself in one sitting, lol. What a great summertime treat! I love how easy it is to make! Thanks for sharing at The Blogger’s Pit Stop! Can’t wait to see what you link up next week! It really is easy. 🙂 Thanks, Roseann! This is my kind of ice cream! Everyone is going to love this refreshing dessert over at Fiesta Friday! Thanks for sharing! Hi, Lisa! I’m sure you can adjust the recipe for the ice cream maker, but I have never used one so unfortunately, I can’t vouch for it. Sorry! I have a friend who thinks they make the best ice cream ever. I am going to make this next time I see them! Haha, sounds like a good plan! 🙂 Hope they like it! Ummm, yes please! That looks great! This recipe is the best of both worlds; a sweet treat and a delicious drink. I am so intrigued by this! Tucking it away to try soon! Thanks for sharing with Party in Your PJs! What a lovely summer dessert, Jas. It would be perfectly refreshing after a heavy meal. Cocktails for dessert are becoming so fashionable. Thank you so much for sharing, and for being a part of the Hearth and Soul Link party. Pinning and sharing this post. Hope your week is going well. OMG, I know I am going to love this. Stop by Over The Moon party since you are being featured. You just made my summer. Pinned! Well, you’re welcome! LOL. So happy you like it, Meg. Thank you!